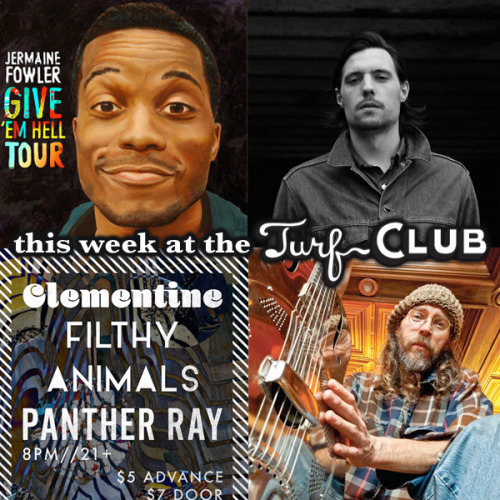 Jermaine Fowler (TruTV’s Friends of the People and MTV’s Guy Code) has been touring the country since he was 21 with Comedy Central, MTV, College Humor, and Funny or Die. This January he sets to embark on his own nation-wide tour in celebration of his debut Showtime comedy special, Give Em Hell, Kid. A genuine, everyday guy with a unique brand of blue-collar rock that is irresistibly likable. He’s endearing and introspective and his debut full length, Debt, is littered with golden melodies that hit the spot. The buzzy rocker is slightly twangy, mostly Americana, and certainly charming. His pull-yourself-up-by-your-bootstraps everyman’s music is supported by a “sprawling” live band and also earned him a slot as one of First Avenue’s Best New Bands of 2014. Come help us as we clelebrate the release videos for “Reason to Stay” and “Hallelujah”. PANTHER RAY: “Instruments and vocal mics trade hands regularly as the multi-instrumentalists celebrate a poly amorous cacophony of junk psychedelia, youth-powered garage rock, exuberant pop weirdness, and experimental studio wizardry. What at first seems amateurish or slapdash, quickly unfolds as fully-intentioned execution of precise tone, technique, and texture that haven’t seen the light of day since 1968, if ever. Sounds appear for a few notes and disappear just as quickly, serving their purpose before making room for the next. JAZZ BRUNCH: Sunday morning jazz with a side of French toast? We thought it was a good idea, too. The James Buckley Trio take the stage (featuring James Buckley, Bryan Nichols, and JT Bates) so you can bebop your way through breakfast. CHARLIE PARR: Charlie Parr is a roots musician like no other today. The Minnesota musician has built a frenzied following of fans around the world with his energetic performances and 12 records. On his 13th album and Red House Records debut, Stumpjumper, Charlie showcases his blistering finger-picking as he switches between acoustic guitar, dobro and banjo – and keening, cut-through-the-crowd vocals that resonate with a conviction that runs deep and true.